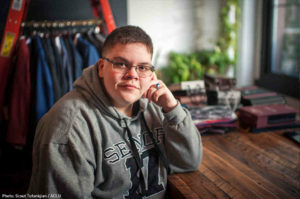 In March of this year, the US Supreme Court was scheduled to hear oral arguments in a case against a Virginia high school that refused to allow student Gavin Grimm access to the same bathrooms as his peers. The case has since been returned to lower courts, but Grimm and the ACLU haven’t given up. Before Grimm starts back to school, he will be joining Gender Odyssey. He spent a little time with guest blogger, Nathan Tabak, talking about conference, and life as a young activist. How do you see your role at Gender Odyssey this year, and why is it important? I’m speaking as a youth transgender activist with a focus on education discrimination. I see myself as just one narrative out of millions, but one lucky enough to get a platform to tell my story. I think telling my story is incredibly important, as it helps to educate people on some of the perils of being a trans student. How has being the plaintiff in a federal court case changed your life? taken on, but that doesn’t make things less difficult. I especially have a responsibility to the trans community to tell people about who we are without speaking for people that I don’t represent. That said, I have also been exposed to more love, community, and support than I ever thought possible. People have supported me in a big way; my family has grown much bigger and much more colorful these last few years. What advice do you have for trans and gender diverse youth seeking to effect change in their communities, particularly in the current climate? My chief piece of advice is one I cannot stress enough: Safety. First. It can be very dangerous to be visibly LGBT, or in some cases just being a vocal ally can put you in harm’s way. You can effect positive change in your everyday life just by staying true to yourself, even if you can only do that privately for the moment. Nothing is more important than your life and safety, which includes mental health as well. If you are in a situation where advocacy and activism is safe, though, then the Internet is your friend. Social media especially can be a boundlessly powerful tool to use when trying to network, organize, and mobilize. Reach out to local LGBT+ centers and orgs. Reach out to online communities. Participate in rallies and elections, and show up to school board meetings where trans kids are defending their humanity. And of course, never forget that your voice matters and is important. What is the most important way that people who are not trans or gender diverse can be effective allies? Being respectful is the best way to be an ally. Don’t ask people personal or medical questions, especially pertaining to their transition. Be an ally whether or not that person is in the room. Don’t let casual transphobia slide. What are you most excited for at this year’s conference? I am most excited to hear the stories of other members of the community and to meet new people. I love people. I love new people. The more people I meet and the more experiences I hear and share, the broader my world becomes. What do you hope to take away from this year’s conference back to your community? I hope that this conference will give me additional insight and knowledge to be a better, more open-minded person, which will impact my community through my interactions with it. Tickets to Gender Odyssey are still available. Join the conversation. This entry was posted in Blog and tagged Activists, Conference, Gavin Grimm, Spotlight, Title IX, transgender. Bookmark the permalink.